e-Safety Case enables users to access and interrogate key information from an asset’s Safety Case in a convenient and understandable format. The key to ensuring safe operations is not only to prepare regulatory documents such as a Safety Case but also to ensure that the results of these studies are communicated, understood and applied by all personnel. 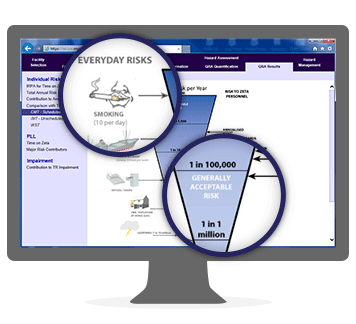 e-Safety Case presents key information from an asset’s Safety Case in a web-based environment enabling staff to access, interrogate and understand this critical information regardless of location. By improving access to this crucial information e-Safety Case is a vital tool in increasing awareness and application of Safety Case data. 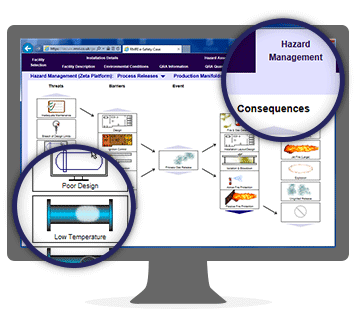 information on an asset’s Safety Management System and an interactive emergency response planning functionality can be included for a complete, easy to use HSE repository and communication tool. To find out how e-Safety Case can improve the understanding and practical application of safety case information within your operations, please contact us.